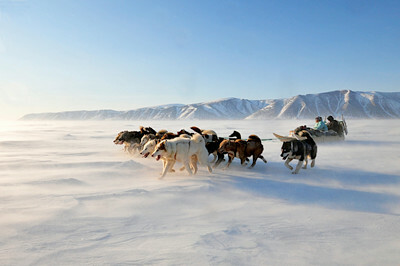 Qaanaaq - dogsledding with local hunters. The legendary Thule district where the resident’s lives are filled with true adventure. In far northern Greenland approx. 1,000 km north of Disko Bay, lies the city of Qaanaaq and its associated settlements. This is the last Greenlandic civilisation before the North Pole. From Ilulissat, you fly through Upernavik to Qaanaaq and along the way you pass the Nuussuaq peninsula and Melville Bay, following the same route that Polar explorer Knud Rasmussen travelled by dog sled on numerous occasions. Up in the north, the hunter lifestyle is still important, and the prey is walrus, muskox, polar bear and narwhal, often caught from kayak. The seasonal contrast is huge. From late October, the polar darkness dominates until mid-February, when the light slowly returns. After a short and hectic spring period, the midnight sun rises high in the sky from late April to late August. During summer, millions of migratory sea birds make their temporary homes in the cliffs behind the settlement Siorapaluk. Narwhal breed in Inglefield Bredning nearby. Winter is dog sledding season, when the fjord and sea ice open the terrain for adventurous travellers. Riding on a dog sled in the midst of the vast and breathtaking scenery, while breathing the cleanest air in the world, is a totally unique experience. During these trips accommodation is in settlements, tents or small huts.